George Washington never told a lie, but did he ever tell anyone about his sweet ink? The Pitt Program Council-sponsored art exhibit “History and Pop Culture in Tattoos” by Pittsburgh artist Lex Covato runs in the Conney M. Kimbo Art Gallery in the Union until Friday, Sept. 25. 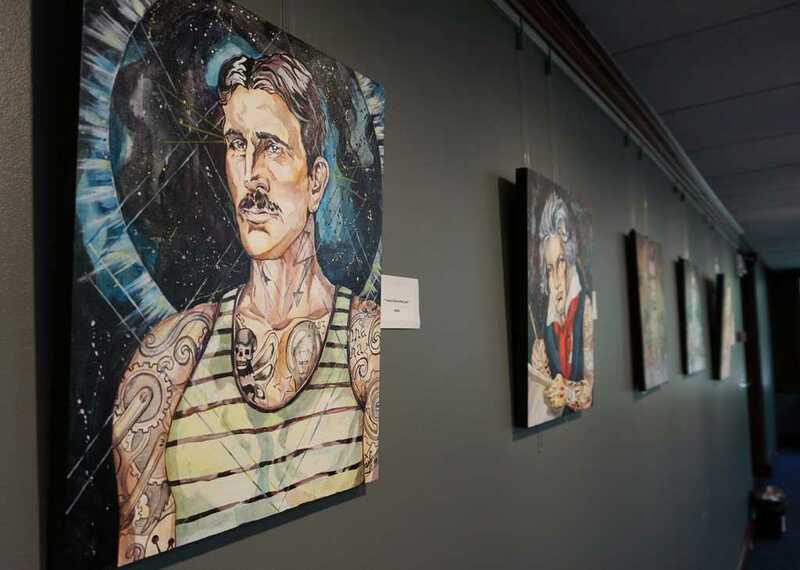 The exhibit’s striking paintings feature reimaginings of various historical figures, including presidents, scientists and pop culture icons, with tattoos covering their bodies that demonstrate their social or historical legacies. Covato said she started some of the work on the display six years ago while studying religious iconography at Chatham. She became inspired by how symbolic religious icons are — down to recognizable props, hand gestures and robes. Every inch of Covato’s subjects’ exposed skin is inked with a story. George Washington bears a heart for his beloved Martha, and an axe and cherry tree. Nikola Tesla features a lightning bolt, representing his innovations in electricity. Covato said she chose characters that stood for something larger than themselves, and ones people revere and love — like Pittsburgh’s own Fred Rogers. Covato’s Rogers has tattoos of his characters from the “Mister Rogers’ Neighborhood” children’s show, as well as a Pittsburgh logo. There is even a popular myth that Fred Rogers wore his signature long-sleeved sweaters to cover up sleeves of tattoos in real life, adding an extra layer of irony to his portrait. In step with the exhibit, tattoos get more popular every year. In 2012, according to a study by Harris Polls, 21 percent of adults in the United States have at least one tattoo, up from 16 percent in 2003. With more and more people getting inked, the likelihood of voting in a real tattooed president is becoming a real possibility. While many candidates can choose to conceal tattoos with a suit or other clothing, Michael MacKenzie, assistant professor of political science at Pitt, said open tattoos will be less stigmatized in the future. One example of a tattooed politician is John Fetterman, the Braddock mayor who recently announced his bid for a seat in the U.S. Senate. The 6-foot-8 Fetterman is notoriously open about his tattoos, including one on his forearm that reads “15104,” Braddock’s zip code, and a separate tattoo for each Braddock murder victim while he’s been mayor. Despite the rising popularity and mainstream attention to tattoos, Covato cautions college students considering getting inked. Covato’s tattoos include her parents’ names on her hips and “la dolce vita” — Italian for “the sweet life” — in script on her lower back. The tattoos, she said, serve as “metaphysical reminders,” and a tattoo that she got with her husband, as a commitment to stand together. “History and Pop Culture in Tattoos” is the first of a number of art displays coming to the Union this year in an attempt to draw more attention to the Conney M. Kimbo Art Gallery, according to Kevin Zedack, the arts and film director of the Pitt Program Council. The paintings featured in the gallery are also for sale, with prices ranging from about $150 to $900, but Zedack said the point of the gallery isn’t to make sales, but to expose the Pitt community to all different kinds of art.